Two major historical archives dealing with Scotland's industrial and maritime past are to be expanded with more than £500,000 of lottery funding. The Scottish Maritime Museum in Irvine has been awarded £412,000 to help it acquire more artwork. Glasgow University's Scottish Business Archive will use £91,800 to develop its collection of records on the Scottish textile industry dating back to 1800. The Heritage Lottery Fund's Collecting Cultures programme made both awards. The aim of Collecting Cultures is to provide money for curators to develop their collections proactively rather than having to wait for a painting or object to become available on the market. It was developed as a one-off programme but proved so popular that the Heritage Lottery Fund has brought it back for a second time. The Scottish Maritime Museum's current collection includes 40 vessels, marine engines and shipbuilding machinery. The lottery funding will help it acquire more artwork, rather than more machinery and engineering exhibits, to help provide a wider interpretation of the maritime industry's importance in Scotland. Acquisitions will include oil paintings, sketches, sculpture studies, photographs and posters, dating from 1750 onwards. 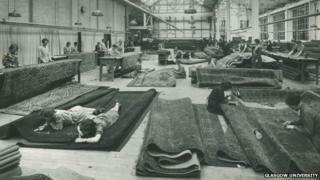 Glasgow University will use its grant to develop the textile section of its Scottish Business Archive. It aims to add items such as fabric sample books, catalogues, industry tools, theatre costumes and clothes made from 19th and 20th century textiles. The university also aims to make its archive more accessible through training, exhibitions and digital resources. Colin McLean, head of the Heritage Lottery Fund in Scotland, said: "Collecting Cultures is a ground-breaking scheme which evolved after a great many discussions with galleries, libraries and archives to find out how we could best support their long-term strategic development. "We are delighted to make these awards today and commend the projects for their plans to increase public involvement and enjoyment of their collections."